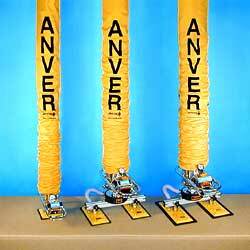 ANVER offers several sizes and styles of vacuum tube lifting systems. Selecting the lifting system that will most efficiently meet your load lifting requirements will increase your productivity and make for a safer working environment. A system with a rated capacity that matches your needs. Models are offered to handle loads of from 5 lb (2.3 kg) for non-porous loads, all the way up to 660 lb (300 kg). While you cannot use a system with a rated load capacity less than your load size, you also should not choose a system that is too powerful. A system that is too large may not operate smoothly. The right vacuum station. ANVER’s HV vacuum pumps produce high vacuum and are ideal for heavy, non-porous loads. HF vacuum pumps produce high flow making them ideal for porous loads. MSP Venturi vacuum pumps can be used in explosive environments or where three-phase electric power is unavailable. The right vacuum attachment based on the type of load. 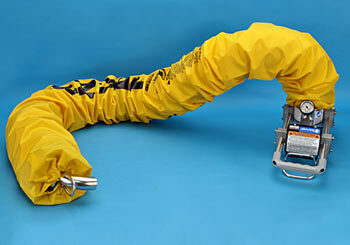 Using the right attachment will not only make your system more productive, but safer to operate. The lifting tube diameter. In a vacuum tube lift system, the vacuum level generated is constant throughout the system. 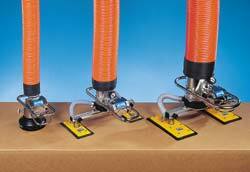 Attachment pads grip the load at the same vacuum level as the vacuum level in the lifting tube. The pad’s gripping force must be considerably greater than the weight of the load to prevent the load from peeling off and dropping. ANVER recommends a gripping force of at least twice the load’s weight. Since both the gripping and lifting operations are accomplished at the same vacuum level, a gripping force twice the weight of the load requires the use of properly rated pads with a seal surface area twice the area of the lifting tube. For some applications, tube lifting systems may not offer the proper lifting capability which is why ANVER also offers combination hoist or balancer lifting systems.